Visits: 60381 persons viewed this recipe. 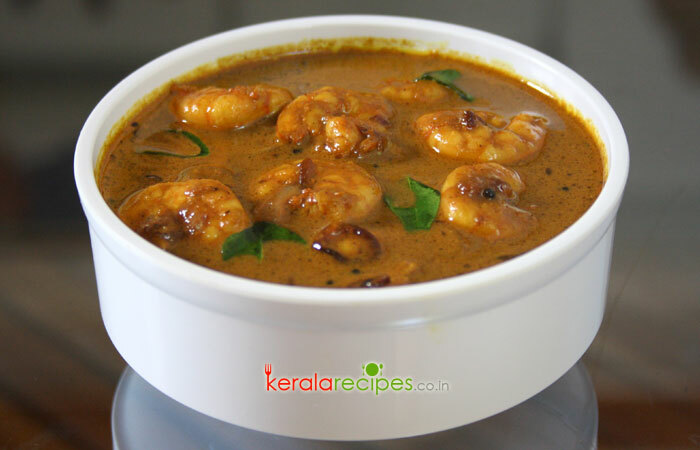 Konju / Chemmeen Theeyal is a prawns preparation with roasted coconut gravy. It is a good accompaniment with rice. So here is the authentic way to make prawns theeyal. Hope you will enjoy it. Wash the prawns and keep aside. Chop ginger, garlic, shallots and tomato. Heat 1 table spoon of coconut oil in cooking pan and put grated coconut, ginger, garlic, half of the chopped shallots and curry leaves (1 sprig). Stir continuously in a medium flame. When it becomes golden brown, turn the flame to low. Put chilli and coriander powders into it and stir well for 2 minutes. Remove from the flame and let it cool. Grind the roasted coconut in a mixer grinder into a fine paste. (Do not add water initially). Dissolve tamarind in 2½ cup of water. Remove the seeds and any pieces that have not dissolved with the water. Cook prawns (about 10 minutes) in a covered vessel along with tamarind dissolved water, tomato, turmeric powder and salt. (When it starts boiling, turn the flame to low). When it is done, add the ground paste and combine it well. Taste for salt. Boil it for 1 minute and remove from the flame. Heat 1 table spoon of coconut oil in a cooking pan and put mustard seeds. When it splutters, to this add remaining shallots and curry leaves (1 sprig). Saute till golden brown. Add this to the prepared prawns theeyal. Chemmeen theeyal is ready for serving. Transfer to the serving dish. 1) Take care not to overcook prawns as it will get rubbery and tasteless. 2) You can also cook prawns in microwave oven (step 7). 3) If you don’t have tamarind, use kukum star (kudam puli) or raw mango as an alternative. But I recommend to use tamarind for this chemmeen theeyal. Hai Dear, It is very nice recipe along with rice. I tried it yesterday as per your instruction. It was very tasty. Thanks a lot. I have a suggestion that please clearly mention quantity of main ingredient will have to take. Hi Sanal, It is great to know that you like this recipe very much. It is already mentioned the quantity of Prawns as 250 gm (weight of cleaned prawns) under the ingredients list. Thank you very much trying this recipe and also for the feedback. Hi Shaan Geo, Very Good Recipe, because my son is too like prawns Theeyal. Thank you. You are welcome Vimla. It is pleasure to know that you all enjoyed it. Thank you so much for taking time to share your feedback. Hi Shaan… It is a very nice recipe. I tried it. It is very easy for preparation. Thank u so much Shan. You are welcome Sandhya. Thanks a lot for your kind words of encouragement and also for the feedback. I like this chemmeen thiyyal recipe. Hai Sir, ee recipe njan cheythu nokki. ente veettukarkk ithu orupad ishtappettu. thank u sir…. You are welcome Annie. Nice to know that you all enjoyed it. Thanks for trying this recipe and also for the feedback. Hi Shaan, I just find out your recipe, have a plan to cook for our Easter party. I have to cook for lot of people. For eg. if I cook with 1kg of prawns, do I have to X4 everything in your recipe. Shibi, The above mentioned quantity is for serving 6 people. If you want to serve it for 24 people you need to multiply the quantity of each ingredient by 4. Hi Shaan, very good recipe. Raji, Thanks for trying this Chemmeen Theeyal recipe and also for sharing your feedback here. First time here, authentic Kerala recipe… prepared it today. Hi Shaan, Tomorrow we have a get together, one of my recipe is chemmeen theeyal, I’m sure everyone will enjoy. For kids prawns with some veggies in coconut milk…. Thanks Shaan for sharing authentic kerala recipe. God bless you! Rajani, Thank you very much for the comment. Happy to know that you choose this recipe for the gathering. Hope it will work out good for you. Please share your feedback. Shaan thanks for sharing this authentic Kerala chemeen theeyal. I made it and it is yummy. Gud with chapatis also.